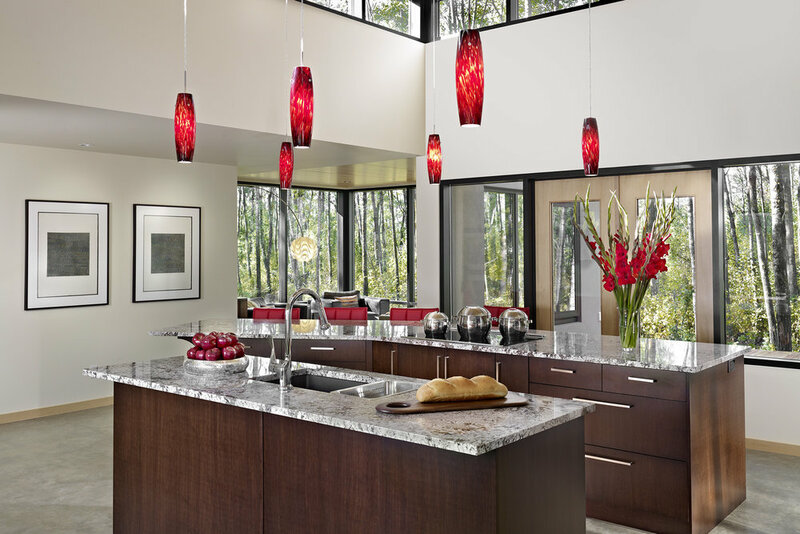 Stainless steel and rich brown cabinets with red accents give the kitchen area its modern look. This kitchen is all about being open to nature. Enjoy this sophisticated and warm contemporary design that makes entertaining family and friends a must. The two islands provide perfect foot traffic flow and plenty of room where more than one cook can comfortably function. Not to mention the beautiful concrete floor, granite counter tops and high ceiling that provides an abundance of natural light. The aluminum framed cabinet doors complement the stainless appliances and add a touch of modern to this stunning home.